Apple Music is much improved, but it is still way too complicated. Fundamentally it is complicated because it wants to be your cloud library for “your music,” that is, music that you have ripped from CDs or bought from iTunes or whatever, while also being a modern streaming service. That decision has led to the centrality of the “library” concept. For a pure streaming service, the concept of a library is simply redundant. There is the streaming catalog, and then your playlists. A “library” need be nothing more than a really big playlist (“My 10,000 favorite songs”) or a meta-playlist that just shows you everything in all your other playlists. There’s no reason to introduce another level of hierarchy, and especially not to hang functionality off of it. For a service that also wants to be a repository of “your” music, maybe you also need a library. But the execution can be improved. Apple has improved on the library concept a number of ways since Apple Music launched. You can now set it so that adding tracks to a playlist from the Apple Music streaming catalog no longer automatically adds them to your library. Previously, your playlists could only have tracks that are in your library, which is bonkers for a cloud jukebox service. Another improvement is that your own music files now either upload to Apple Music, or match to DRM-free cloud files that you can download free of any restriction on any other computer. Previously, they only matched to entries in the Apple Music streaming catalog, and downloading them was the same as downloading any other Apple Music track–that is, they were DRM’d tracks tied to your subscription. There are real improvements! Nevertheless the centrality of the library concept still holds Apple Music back. For example, some kinds of metadata only sync between devices for tracks that are in your library. If you create a playlist of tracks, half of which are in your library and half of which are not, and then listen to it 10 times on your iPhone, when you pull up that playlist in iTunes on a Mac, only the tracks in your Apple Music library will have playcounts. That is just silly. Whether or not you have listened to a track is a fact that has nothing to do with whether it is in your library. Another consequence: in the iOS app, there is now a “downloaded music” section. This is helpful! But if you browse in this section by artist or album you will see, not the artists and albums currently downloaded to your phone, but only the artists and albums downloaded to your phone that are also in your library. So, if you make a playlist of 10 new albums to check out (and why would you want them in your library?) and save it offline, none of them will show up under the artist or albums area of your downloaded music. Those tracks will only be visible if you look under that specific playlist. Again, this is silly: An album is either downloaded to your phone or not. Why are albums that are downloaded to your phone not visible in the “albums” view of the downloaded music section unless they are in your library? My solution would be this: Your iCloud Music Library should contain only matched and uploaded songs. It should not be possible to add Apple Music tracks to your library. 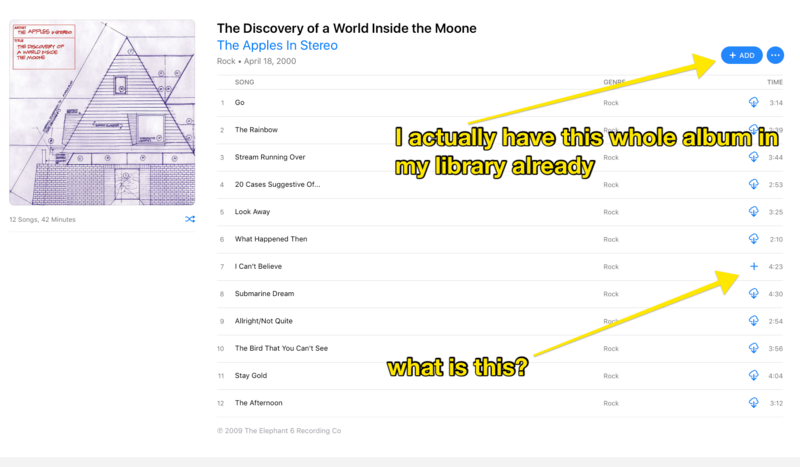 Your library is your music that you brought to Apple Music, and it should not intermingle with Apple Music tracks. When I check out a book from the library, I don’t make room for it on my shelves. This means that when you search for an album in Apple Music, you shouldn’t see the “Add” button, or the cloud button that you see when Apple Music thinks that album is already in your library. It’s worth pointing out how confusing those buttons are in practice, by the way. 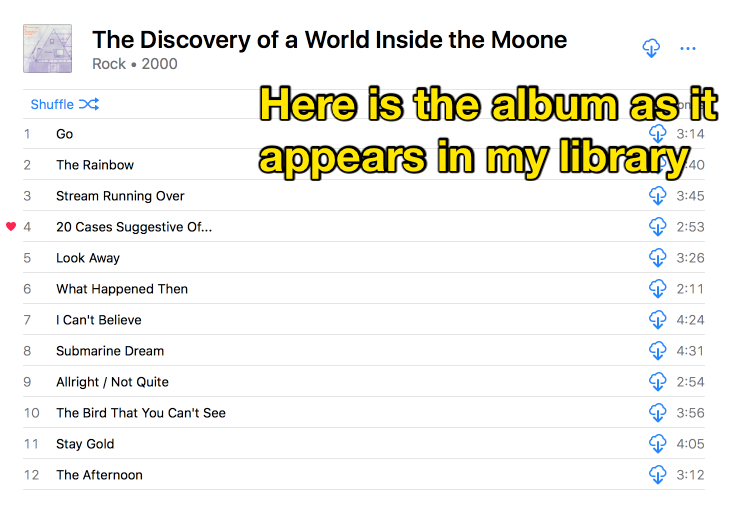 Here’s what happens when I look up the album “The Discovery of a World Inside the Moone” by the Apples in Stereo in Apple Music. Finally, when it comes to browsing-type features–where currently I can browse my library by artist or album or song–make it so that I can just browse “My Library” (uploaded and matched tracks) or “My Library and Playlists” (which gives people that want it the ability to build a “collection” of songs they don’t own). This would seem to provide the best of both worlds, and would be conceptually simpler.